Dunscombe & Allied Families - GRAVE OF MEHETABEL (SHERWOOD) HUBBELL, OLD BENNINGTON CEMETERY, BENNINGTON, VERMONT. 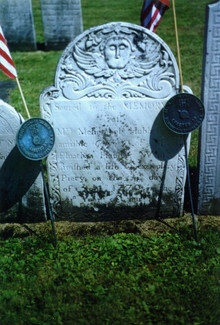 INSCRIPTION: "SACRED TO THE MEMORY OF MRS. MEHETABEL HUBBELL AMIABLE CONSORT OF MR. ELNATHAN HUBBELL WHO FINISHED A LIFE OF EXEMPLARY PIETY ON THE 24TH DAY OF SEPT. 1770 IN THE 51ST YEAR OF HER AGE"
GRAVE OF MEHETABEL (SHERWOOD) HUBBELL, OLD BENNINGTON CEMETERY, BENNINGTON, VERMONT. INSCRIPTION: "SACRED TO THE MEMORY OF MRS. MEHETABEL HUBBELL AMIABLE CONSORT OF MR. ELNATHAN HUBBELL WHO FINISHED A LIFE OF EXEMPLARY PIETY ON THE 24TH DAY OF SEPT. 1770 IN THE 51ST YEAR OF HER AGE"